Writer and Publisher of the award-winning New Zealand Outside for ten years. 1996 - Prime Minister Jim Bolger gifted copies of the prestigious publication to all delegates and visitors to New Zealand for the 14th Commonwealth Heads of Government meeting. 1999 - Prime Minister Jenny Shipley gifted New Zealand Outside to President Clinton. Awarded the first prestigious National Tourism Media Award - for presentation, success, content and giving back to the community. Editor of the Year finalist in the Magazine Publishing Awards 2002. Publisher of the Year finalist in the Magazine Publishing Awards 2002. Magazine Front Cover of the Year in 2002. New Zealand Outside magazine created a Trust to contribute to environmental projects in New Zealand, assist outdoors people in extremely difficult circumstances and introduce underprivileged children to the outdoors. The Trust was expanded to include the support of a programme that effectively helped youth at risk by assisting to increase literacy for hundreds of young people. It also assisted young people to get off drugs using a drug-free rehabilitation program to do it successfully. Charlie Hobbs is one of New Zealand’s most highly respected mountain and ski guides. Charlie was in charge of all Search and Rescue services to McMurdo Sound for the USA and also to Scott Base for New Zealand. Charlie has been in charge of a total of five separate expeditions into the deep field of Antarctica on behalf of the US Government and the National Science Foundation. His charge was the safety of geologists in the field and full responsibility for mountaineering and guiding which involved first ascents of very remote peaks in the Antarctic to collect geological samples. Included in his resume are many successful first ascents in Antarctica. In an expedition to Antarctica in association with the US National Science Foundation Mary and Charlie were in the deep field for a number of weeks assisting two geologists on their scientific exploration. Mary is experienced in medical training and had previously specialised in orthopaedics and coronary care. She accompanied Charlie to the Deep Field in Antarctica on the above expedition and was responsible for First Aid and management of the camp in one of the most remote parts of the world. Following these expeditions the couple were invited to become Fellows of the New York Explorer’s Club in New York City. Charlie and Mary directed and produced a technical mountaineering film - Staying Alive. It includes technical details for helping people to stay alive in the mountains and sells internationally. Mary and Charlie were invited to accompany their good friend Sir Edmund Hillary to the Himalayas to view his aid projects. (Sir Edmund was the first man to summit Mount Everest in June of 1953. He created The Himalayan Trust that has built many schools, hospitals and teaching colleges for the Sherpa people of Nepal.) Sir Edmund asked Mary to take many photos of the Aid projects so he could use them in international slide shows throughout the world for the Himalayan Trust. Mary contributed to the Himalayan Trust by providing her work and the development of the film free of charge. Sir Edmund was delighted with the results and the photos have since become a major part of his presentation on the international stage to help raise funds for the Himalayan Trust. Charlie has trained world-famous actors in the techniques of mountain guiding. Charlie has assessed many trainee guides for their international qualifications in ski and mountain guiding and was the chief consultant and advisor for the Mountain Safety Council and gave service to this organisation for over 25 years. Charlie pioneered heli-hiking on the Tasman Glacier. After 9/11 Mary and Charlie wanted to do something to help, so they created a book that bypassed political views and reached out to people from one nation to another. The book is comprised of heart-felt messages with their photos, from New Zealanders to the American people. The brief for each message was that it had to be positive and uplifting. It includes letters from the Prime Minister and Governor General to every-day New Zealanders. The majority of photos of those in the book were taken by Mary. She asked each person to look into the lens of her camera and think of their unknown friends with love. The book touched the hearts of thousands of Americans and Kiwis. NZ Politicians wrote that they felt honoured to be invited to contribute. Mary and Charlie flew to NYC and Washington, at their cost, and and personally visited firehouses in Manhattan and gifted the book to rescue-workers, fire fighters and policemen. The NY Fire department gave the couple a personal tour of Ground Zero in NYC, where copies of the book were also left for other visitors. Feb 14, 2002 Paula Zahn of CNN interviewed the couple live on her Prime Time breakfast show. The Daily Standard in Washington gave it a very positive report and a personal note of thanks was received from the editor Claudia Winkler. The Prime Minister of NZ wrote a letter of introduction for Mary and Charlie to President Bush. She said the book acknowledged the vitality, determination and strength of spirit of the American people that will enable them to overcome the challenges posed by those awful events and strives to bring nations together through the simple act of reaching out to one another. Mary and Charlie flew to Washington DC and presented a copy of the book at the White House. In March 2003 the New Zealand Prime Minister Helen Clark personally presented a copy of the book to President Bush, with Colin Powell and Condelezza Rice in the Oval Office. President Bush wrote to the Prime Minister thanking her for the book and described it as a thoughtful gesture and a tribute to the shared values of our countries despite the geographical distance. He looked forward to working with her to strengthen the friendship between their countries. Prime Minister Clark presented a copy of the book to the Mayor of NYC, Michael Bloomberg who wrote to Mary and Charlie to say he was honoured to receive it. Prince Charles and the Duchess of York separately wrote very positively about the compassion in the book. A later dispatch from the NZ Ambassador in Washington, to the Prime Minister's Office, indicated that the book had been influential in helping bring the countries closer together and healing old rifts. The couple built a prestigious restaurant in the Mount Cook National Park of New Zealand. The restaurant - that also includes a plan to expand to include accommodation - has since become a national icon with its tribute to the spirit of mountaineering and mountain guides of the area since the 1800s. Mary and Charlie continue to guide, write and publish from this International Wilderness Heritage Park. Mary and Charlie travelled to South Africa to view national parks that provide lodge accommodation. They subsequently submitted an application to buildan Inn, and a separate Health Spa Hotel, within the Mount Cook National Park. Mary and Charlie went on expedition to the Tibetan (north) side of Mount Everest in March of 2005. This story spans the personal journeys of Mary and Charlie that eventually led them to each other and to living at Aoraki-Mount Cook National Park. It is a rollicking read that will take you from Tibet to Antarctica; to Nepal with Sir Edmund Hillary; and to New York, Washington and the White House in the aftermath of 9/11. It includes the thrills and spills of a nursing profession; the excitement of launching a new career as a writer and publisher; the challenges of starting up and running a guiding business in an area that, at the time, was competing against a monopoly. But it is particularly the story of realising the dream of building The Old Mountaineers’ Café, Restaurant, Bar and Historic Photographic Gallery against all odds. The book recounts their rip-roaring David and Goliath battle to establish The Old Mountaineers' Cafe at Aoraki-Mount Cook against the opposition of an existing multimillion-dollar business and the Department of Conservation. It is a New Zealand story, from the heart. Mary and Charlie finalised plans for the building of a rustic Inn (The Old Mountaineers Inn) and a Health Spa hotel at Aoraki-Mount Cook. These plans were dreamed up in 2004, when they were facing some of the most formidable opposition in the national park. It took ten years for these applications to be approved. Wrote and compiled the book Christchurch Dreaming, published by HarperCollins. Mary donated a generous percentage of her royalties to the Salvation Army in Christchurch. Both Mary and Charlie also drove to Christchurch and helped out in the inner city from the night of the devastating earthquake in February, 2011. Christchurch Dreaming is a book of optimism for those who love all that is great about Christchurch and Canterbury. In pictorial and written form, it takes the reader on a journey from its early years of establishment, through past tragedies overcome and triumphs celebrated. It shows the courageousness of Cantabrians who remained resolute after the earthquakes, and shares a vision for the future Christchurch. Glimpses of the personal story of the author's ancestors are threaded through the chapters, and highlights how events through the generations have touched the lives of all who call Canterbury home. The stunning imagery illustrates what Christchurch and Canterbury are still able to enjoy, and is combined with heartfelt messages from Cantabrians from all walks of life who openly share what they love about the people and their region, and their dreams for its future. Messages from Cantabrians include those from the Prime Minister, the Mayor, All Black Dan Carter, All Black Captain Richie McCaw, Roger Sutton (Cera), firefighters, the Farmy Army and the founder of the Student Army. Christchurch Dreaming also features exciting concepts for the new Christchurch from some of our most talented architects. They invite the reader to dream of the new options now available, and to also realise that nothing is impossible, for the positive spirit and determination that is so prevalent in Canterbury can turn those dreams into a reality. Mary and Charlie purchased a farm on the banks of Lake Pukaki where they built a home with a focus on using as much in the way of toxic-free products as possible. It was an exhausting job. A book on it will eventually be written about that journey. They found that there is a difference living in a toxic-free home and that what people call a green building is not necessarily so. 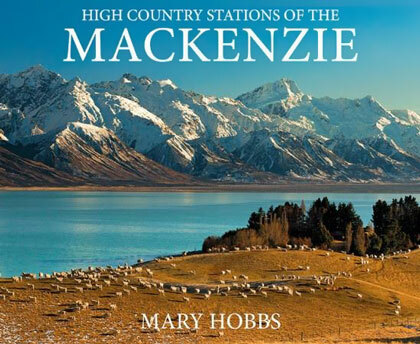 In 2015, Potton & Burton published Mary’s sixth book, High Country Stations of the Mackenzie, which features the history of most of the high country stations surrounding Lake Pukaki. Almost all of the contemporary photos in the book were taken by the author. The book became a best-seller. In November 2017, Potton & Burton published Mary’s seventh book, High Country Stations of Lake Tekapo, featuring the history of the high country stations surrounding Lake Tekapo. Most of the contemporary photos in the book were taken by the author. Mary is currently planning her eighth book, planned for publication in November 2019.